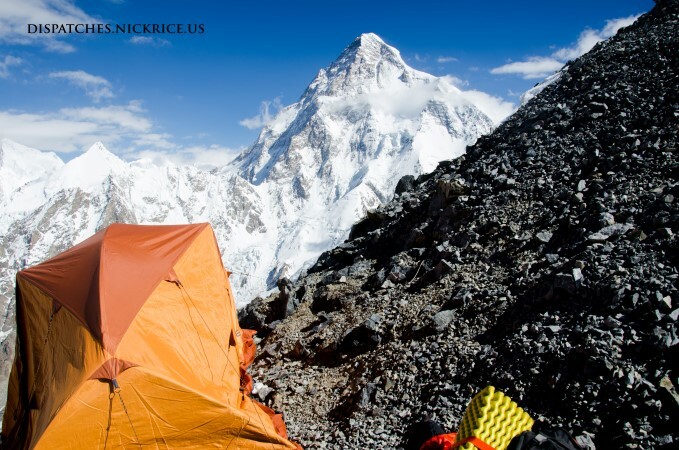 My precarious Camp II tent with the upper flanks of K2 visible in the background. Today, I woke up at 4:00am, had a tea and a protein bar, and headed out into the bitter cold toward Camp III. The whole morning, I couldn’t feel my hands or feet and at 6450m, I decided that I should descend. I reached Camp II again at 7:45am and quickly packed up the things I needed to bring back down to Camp I, then began rapidly descending toward Camp I, hoping that my hands and feet would thaw out. Thankfully they did as the sun began to shine on the slopes and I arrived quite quickly to Camp I where I deposited my gear and continued toward Base Camp. I finally arrived to Base Camp at 11:30am after crossing two ladders which had been installed to allow climbers to cross what had become fast-moving rivers that would have otherwise prevented us from reaching the mountain. Once back in Base Camp, I said my hellos to Lina and Pilar who had arrived an hour or so earlier from Camp I and then showered, ate lunch, unpacked, and visited with the Hungarian and Polish climbers and Alex Gavan (Romania). Afterwards, we had a leisurely dinner with a Catalan climber and then went to sleep under a full moon.